Poet Bill Berkson and painter Michael Goldberg became close through their mutual friend, the poet Frank O’Hara. Though O’Hara wasn’t directly involved in this work’s making, he is nonetheless everywhere present within it. Its diction, campy locution, and collaborative creation all betray his fingerprints, as does the work’s affiliation with what the poetry world calls “occasional poetry,” works composed to commemorate a particular moment, often written on the spot. 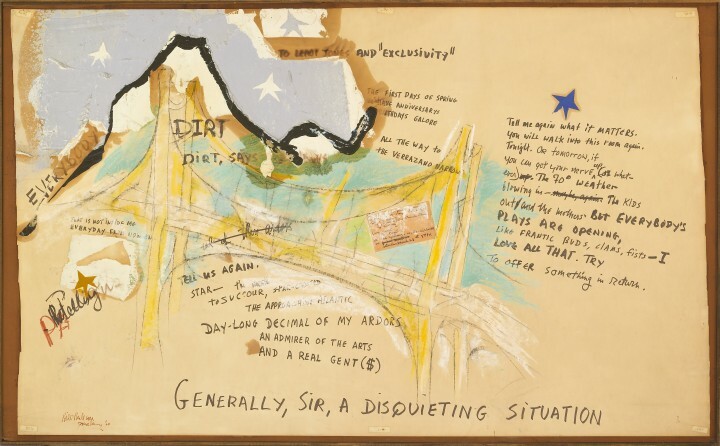 In this instance, Berkson decided to write on sheets of paper and send them to Goldberg, who at that time was confined to the New York Psychiatric Hospital, a voluntary admission that Goldberg elected as a plea deal to keep him out of jail. Goldberg, Berkson, and O’Hara had collaborated earlier on artwork with poetic texts, so the painter understood that the receipt of these blank sheets with fragments of poetry was intended to spur him to creative activity. This was a gesture of friendship, meant to entertain and cheer him up during his long hospitalization. Berkson recalls that in this particular work, all the writing was his. Yet despite the fact that the hand is Berkson’s, the spirit of O’Hara powerfully infuses the work. In some instances O’Hara’s presence is literal, as in an orange announcement card, seemingly affixed to the upper cable of the bridge. The card publicizes the 1964 production of O’Hara’s new play, The General Returns from One Place to Another, on a double bill with LeRoi Jones’s one-act The Baptism. This explains the dedication to LeRoi Jones (now known as Amiri Baraka) and “exclusivity” at the top of the image, the scare quotes yet another reference to the arch voice of O’Hara, as he sought to marry the significance of a word with its typographic projection. Berkson’s winking locutions evidence O’Hara’s presence more subtly; so resonant are they of the older poet’s characteristic camp voice. Berkson writes, for example, Everybody / that is not inside me / everyday from now on. Further down the page he writes, Day-long decimal of my ardors / An admirer of the arts / And a real gent ($), the dollar sign, along with the reference to decimals in the context of ardors, thus suggesting that artistic patronage was not the only form of this particular gent’s largesse. I want to be clear that Berkson denies that these lines were intended to read as gay in any way. And I’m not saying he’s misremembering or wrong. Rather, the fact that a palpably gay idiom such as O’Hara’s could be so naturalized across the early 1960s art world as to be invisible as such is precisely my point. Berkson himself freely articulates that, at this moment in his career, “I adopted, imitated, and parodied so many things about Frank between 1960 and about then.”1 (In other words, around the date of this work, 1964.) Berkson was hardly alone in this regard; O’Hara’s influence in the art world was, and remains, legendary. Painters and poets in the late ‘50s were each other’s chief audience, and their aesthetic cross-fertilization seems a logical outcome of this fact. But it’s worth distinguishing at this point between paintings, such as this collaboration, that feature poets writing on painter’s canvases—perhaps the majority done in concert with O’Hara himself—and another kind of textuality in painting. The latter mode, more centrally the theme of this exhibition, takes place when painters don’t outsource the writing in their work, but both write and paint themselves. In this instance, the particular subject of this exhibition, writing and painting become extensions of one another—and in some regards indistinguishable. Here, however much a collaboration, poet and artist remain separate, each responsible for their own art form. Yet that separation is in no way evident in the painting, which holds together as a single image, no matter how separate the hands that made it. 1. Bill Berkson, telephone conversation with author, June 26, 2014. Bill Berkson (b. 1939, New York, NY) has studied at Brown University, Providence, Rhode Island; Columbia University, New York; The New School for Social Research, New York; and The Institute of Fine Arts, New York University. Berkson has authored about 20 books and pamphlets of poetry, such as Hymns of St. Bridget & Other Writings, a collection of his 1960s collaborations with Frank O’Hara, and Gloria, a portfolio of poems with etchings by Alex Katz. He has received awards and grants for poetry from the National Endowment for the Arts, Yaddo, the Poets Foundation, the Marin Arts Council, the Briarcombe Foundation, and the American Academy in Rome. He was a Distinguished Paul Mellon Lecturer at the Skowhegan School of Painting and Sculpture, Maine (2006). He was granted the Artspace Award for Art Criticism (1990), and published a selection of his criticism entitled The Sweet Singer of Modernism and Other Art Writings (2003). He has acted as Corresponding Editor for Art in America since 1988, as Contributing Editor for artcritical.com since 2008, and on the Editorial Board of American Painters. Berkson regularly contributes to Artforum, Art on Paper, and American Craft. He has curated exhibitions featuring individual artists like Ronald Bladen, George Herriman, and Albert York, and served as Adjunct Curator for the exhibition entitled Facing Eden: 100 Years of California Landscape Art, Fine Arts Museum, San Francisco. Berkson taught art history, art writing, and poetry at the San Francisco Art Institute, California (1984-2008) and briefly assumed the position of its interim dean (1992). Berkson currently lives and works in San Francisco. Michael Goldberg (b. 1924, Bronx, NY; d. 2007, New York, NY) was an abstract painter of the New York School. He began taking classes at the Art Students League of New York and studied painting at Hans Hofmann’s School of Fine Art, New York (1938-1950). At the age of 18, he volunteered for service in the United States Army during World War II. After continuing his studies at the Art Students League and with Hans Hofmann, he began to paint for a living and soon took over Mark Rothko’s Bowery loft studio. Goldberg’s work first appeared publicly in the Nine Street Show (1951), a significant exhibition organized by Leo Castelli. His first solo show was held at Tibor de Nagy Gallery, New York (1953). Recent solo exhibitions were held at Knoedler & Company, New York (2007, 2010); Weinberger, Copenhagen, Denmark (2007); Galleria Peccolo, Livorno, Italy (2007); Galerie Biedermann, Munich, Germany (2008); and University Art Museum, California State University, Long Beach, California (2010). A recent retrospective of his work opened at the Museum of Contemporary Art Jacksonville, Florida (2013). His work is represented in numerous public collections, including: Albright-Knox Art Gallery, Buffalo, New York; The Art Institute of Chicago, Illinois; Baltimore Museum of Art, Maryland; Solomon R. Guggenheim Museum of Art, New York; The Museum of Modern Art, New York; Museum of Fine Arts, Houston, Texas; Museum of Modern Art, Jerusalem, Israel; Museum of Modern Western Art, Tokyo, Japan; and the Philadelphia Museum of Art, Pennsylvania. Jonathan D. Katz (b. 1958, St. Louis, MO) was the first full-time American academic to be tenured in the field of gay and lesbian studies. He founded and chaired both the Harvey Milk Institute, San Francisco, and the Queer Caucus for Art of the College Art Association. He co-founded Queer Nation, San Francisco, and the Gay and Lesbian Town Meeting, Chicago. As an Associate Professor at Yale University, New Haven (2002-06), Katz was Founding Director of its Lesbian and Gay Studies Program. He has been the Terra Foundation Senior Fellow at the Courtauld Institute of Art, London. Katz co-curated the exhibition Hide/Seek: Difference and Desire in American Portraiture, which opened at the Smithsonian National Portrait Gallery, Washington, D.C. (2010), and traveled to The Brooklyn and Tacoma Museums. Hide/Seek received the Best National Museum Show Award (2011) from the International Association of Art Critics, and its accompanying book was voted the best LGBT non-fiction (2011) by the American Library Association. Katz currently directs the doctoral program in Visual Studies at the University at Buffalo, New York. He is completing two new books, Art, Eros and the Sixties, and The Silent Camp: Jasper Johns, Robert Rauschenberg and the Cold War, to be published by the University of Chicago Press. His exhibition entitled Classical Nudes and the Making of Queer History is opening at the Leslie Lohman Museum for Gay and Lesbian Art, New York (2014), where Katz serves as President. His next major exhibition, ArtAIDSAmerica, opens at the Los Angeles Museum of Contemporary Art (2015) and will travel to four other museums across the United States. Bill Berkson, telephone conversation with author, June 26, 2014.